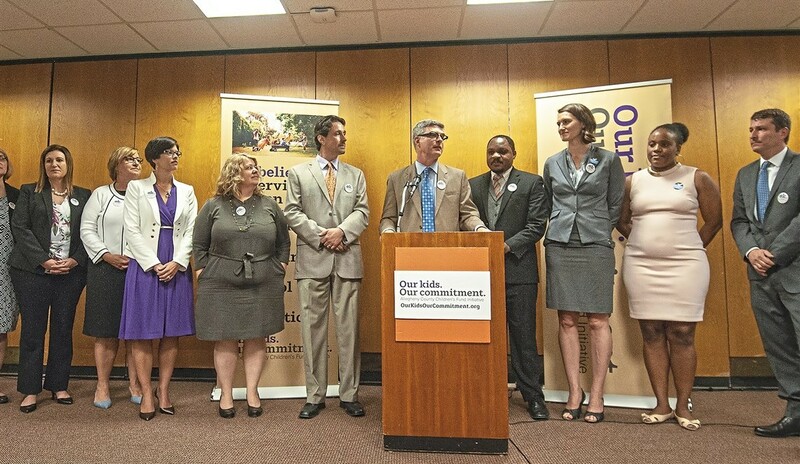 Pittsburgh Post-Gazette – A coalition of advocacy groups will gather signatures this summer aiming to put a referendum on the November general election ballot proposing a quarter-mill property tax increase to bolster early learning, after-school programs and nutritious meals for children in Allegheny County. The groups kicked off their “Our kids. Our commitment.” campaign Wednesday for the proposed Allegheny County Children’s Fund. The fund’s impact could be “transformative” for both individual children and the region as a whole, said Patrick Dowd, executive director of Allies for Children, and an advocate for the initiative. Organizers must gather more than 40,000 signatures during a 49-day window over the summer, between June 19 and Aug. 7. If they are successful in collecting enough valid signatures from registered voters, the question will appear on the Nov. 6 general election ballot, and if approved would amend the county’s home-rule charter. “It’s an excellent opportunity for the public to say that they believe kids are important,” said Dave Coplan, executive director of the Human Services Center Corporation, based in Turtle Creek. If approved, property owners would pay an additional one-quarter mill tax of $25 annually on each $100,000 of a home’s assessed value, beginning next January. The fund would collect approximately $18 million to $19 million annually, organizers say, focused on three core areas for kids that have proven benefits for children and communities: early learning, after-school programs and nutritious meals. Organizers don’t promise universal coverage for all Allegheny County children in those programs, but say it would be a significant commitment of local funds. “Investing early has so many returns so soon,” said Lindsay Cashman, advocacy and public policy director at PUMP. At a downtown news conference Wednesday, advocates touted benefits such as reduced crime, bolstered school attendance and public safety. The fund would give kids the tools they need to thrive, said James Doyle, executive director of Higher Achievement. The fund would be administered by an office within county government, The Office of the Allegheny County Children’s Fund, that would have an advisory commission of volunteers. Money would be disbursed begining in 2020. There’s more than 30 similar funds in counties nationwide, groups supporting the fund say, in states both red and blue. Organizers have emphasized they view the issue as non-partisan, and have not sought the endorsements of local elected officials. Several officials didn’t embrace the idea. Allegheny County Executive Rich Fitzgerald said he is supportive of additional dollars for early learning, but disagreed with funding it through increased property taxes. “I think if we could have some other form of revenue, it makes a lot of sense,” he said. Under state law, property tax is the only available tax via the voter referendum process. Other taxes require state-level approval from Harrisburg. Advocates say they have a broad coalition of support, from the non-profit, business, faith and labor sectors. Ms. Cashman, whose organization is open to people of any age but which is largely people age 25 to 35, said PUMP’s members and constituents see the initiative as a matter of equity. The group will host a kick-off signing event at 11 a.m. June 19. More information is available online at ourkidsourcommitment.org. NOTE: This story has been updated from the original – the paraphrase of Chelsa Wagner’s statement has been changed for clarity.